St. Basil (329-379) was a brilliant student born of a Christian family in Caesarea, Cappadocia (Turkey). For some years, he followed the monastic way of life. He vigorously fought the arian heresy. He become Archbishop of Caesarea in 370. Monks of the Eastern Church today still follow the monastic rules which he se down. 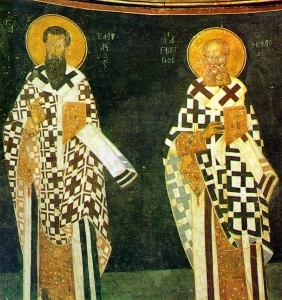 St. Gregory (329-389) was also from Cappadocia. A friend of St. Basil, he too followed the monastic way of life for some years. In 381 he became Archbishop of Constantinople. It was during this period the Arian heresy was at it height. He was called "The Theologian" because of his great learning and talent for oratory. and practice it faithfully in charity. I therefore, a prisoner for the Lord, beg you to lead a life worthy of the calling to which you have been called, with all lowliness and meekness, with patience, forbearing one another in love, eager to maintain the unity of the Spirit in the bond of peace. There is one body and one Spirit, just as you were called to the one hope that belongs to your call, one Lord, one faith, one baptism, one God and Father of us all, who is above all and through all and in all. But grace was given to each of us according to the measure of Christ's gift. And his gifts were that some should be apostles, some prophets, some evangelists, some pastors and teachers, to equip the saints for the work of ministry, for building up the body of Christ, until we all attain to the unity of the faith and of the knowledge of the Son of God, to mature manhood, to the measure of the stature of the fulness of Christ.